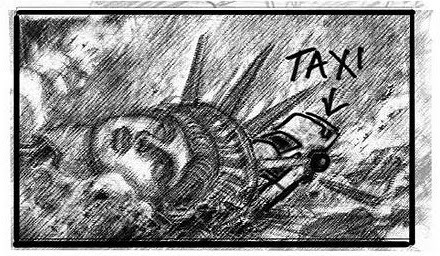 Check out Cloverfield concept art/storyboards by Josh Sheppard! The Cloverfield trailer took in world by storm when it premiered before screenings of Transformers back in 2008. The image of the Statue of Liberty's head rolling into the streets of New York sent fans into a frenzy trying to figure out the meaning of the film's working title: 1-18-08. One of the artists that helped visualize that striking scene is Josh Sheppard and he shared a sample of his storyboards on his site thestoryboardartist.com. Joshua Sheppard is a professional concept and storyboard artist based in L.A. who's worked on blockbuster movies like Lincoln (2012), Jack the Giant Slayer (2013) and the upcoming Thor: The Dark World (2013). Here's what he says about the boards at his site. Sheppard said, "This was NUTS! It went from loose development, straight into production and filming of this trailer, THEN we started pre-production on the film! "The producer [J. J. Abrams] and I worked on several iterations of this, trying to find the right tone, based on his verbal pitch to me. It had to feel absolutely real, which is why he hired an actor’s director [Matt Reeves], rather than someone who specializes in action. "The shooting style was a major challenge, because we couldn't just cut to another angle for shooting convenience. The tight deadline, various locations and sets, VFX, and top secret script made this thing really hard to hammer into shape. We had a skeleton crew, but everyone was excellent." Click on the links to check out my other Cloverfield movie designs or Josh Sheppard's storyboards. What do you think of the storyboards? If you've seen Cloverfield what did you think? Cool! Thanks for sharing these! I imagine shooting just from one viewpoint was tough to storyboard.